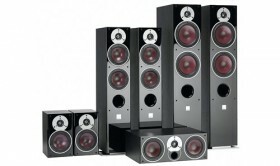 Dali, also known as Danish Audiophile Loudspeaker Industries recently released a new series of speakers called Zensor. The new Zensor series is supposedly replacing the previous concept-series in the Dali entry level segment. The Zensor lineup includes one bookshelf model called Zensor 1, two floor standing models called Zensor 5 and Zensor 7 and a center channel speaker called Zensor Vokal. Currently there’s no subwoofer released in the Zensor series but my guess is that there will be at least one subwoofer just like there was in the concept-series. As usual, I went to audition them! Considering the price on the Zensor models I must say that the build quality is absolutely amazing! The drivers have baskets made of stamped steel and sport a quite big ferrite magnet. The picture below shows the tweeter and the 5-inch driver. Even though the cabinet finish is vinyl veneer wood imitation they definitely look and feel much more expensive than they really are. They are available in black ash or walnut finish and the front baffle have high gloss piano lacquer. 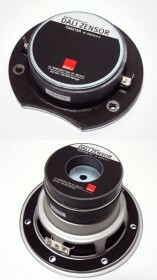 All models are 2-way constructions and they all share the same 1-inch textile dome tweeter. The bookshelf speaker has a single 5.25-inch bass/mid driver, the two floor standers each have dual 5.25-inch or dual 7-inch bass/mid drivers and the center speaker has dual 5.25-inch bass/mid drivers. My local Hi-Fi dealer had the Zensor 1 and the Zensor 5 up for demo while the Zensor 7 was not in stock at the moment. I started with the bookshelf model and was quite surprised about how big and self-confident they sound! The bass from Zensor 1 is far from massive but they do pack a lot more punch than I had expected. In a small stereo setup you could very well manage without a subwoofer if you don’t crave the night club bass levels. The treble and highs are somewhat soft and rolled off but other than that the whole sound image and character is open and well balanced. Switching to the floor standing Zensor 5 instead and you right away get the same sound character, only a bit larger soundstage and a lot more power and deep bass. I can only imagine the authority that the Zensor 7 would perform with. Over all I am very impressed with the sound and the performance of the Zensor series. The Zensor’s really deliver good performance and value for the money and I highly recommend you give them an audition if you are looking for a good all-round speaker for decent money! Nice, I think I’m going to buy the Zensor 5 speakers and a B&W sub. Have you listened to the Zensor 7 speakers yet? If so, is it worth getting them instead of the Zensor 5? Just listened to Zensor 7. Really nice powerful and detaild sound for this amount of money!